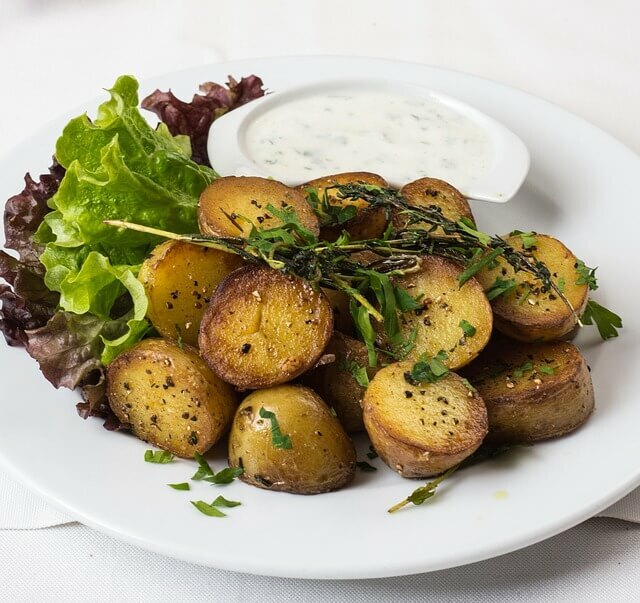 Garlicky roasted potatoes is a simple and delicious side dish that you can make in a short period of time and with ingredients that you already have in your kitchen. Just arrange thick chunks of red potatoes tossed in olive oil, garlic powder, salt, and pepper on a baking sheet in an oven heated to 425°F. Roast the potatoes for 15 minutes, then flip them until tender and browned. Before serving, squeeze lemon juice over them, then toss to combine. For the complete recipe and tips, visit http://www.thekitchn.com/recipe-3-ingredient-garlicky-red-potatoes-250963. You can make a delicious side dish that’s quick and easy from red potatoes, garlic powder, olive oil, lemon juice, and salt & pepper. Buying a high-quality garlic powder may be worth the extra cost because it will add much more flavor than cheaper brands. You don’t need a lot of special ingredients to make a yummy dish to feed your family this Thanksgiving.